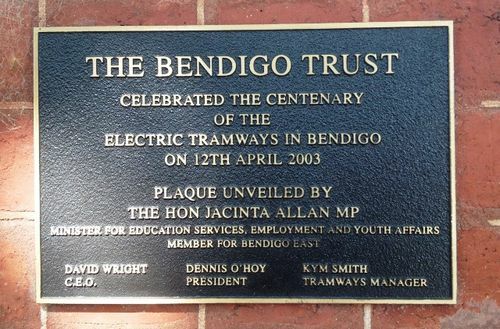 Plaque commemorates the centenary of the electric tramways in Bendigo. In 1890 Bendigo experimented with Battery trams, but it is no surprise that the experiment failed and sent the operator bankrupt. So, from 1892, the town was served by a Steam tram system, which lasted until 1902. In 1903, the Electricity Supply Company of Victoria (a British company) introduced electric trams, partly as a way of selling electricity to customers along the routes. Among them were two single-truck toastrack trams (also called Summer Cars) which were built for the Bendigo tramways in 1913. One of these is preserved at the Bendigo Tramways.